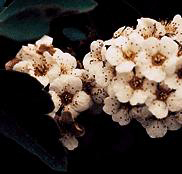 A large shrub to small tree that grows up to 8 metres tall, armed with stout, straight thorns 1 to 2 centimetres long and bearing showy, white flowers during May and June. Oval leaves are 3 to 6 centimetres long, with 5 to 9 small lobes at the top. White, saucer-shaped flowers in flat-topped clusters. Clusters of small, blackish "apples" (haws) that wither quickly when ripe. It is found from sea level to mid elevations south of Fort St. John, along water courses and meadowland thickets. 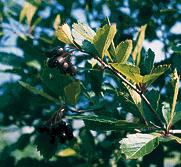 The Columbian or red hawthorn (Crataegus columbiana) is a smaller tree or shrub with long slender thorns and red fruit. It also grows along water courses and on dry hillsides in the southern Interior. The English hawthorn (Crataegus oxycantha), an ornamental garden tree, is naturalized on the southern coast. Its leaves are deeply lobed, and the fruit is red. 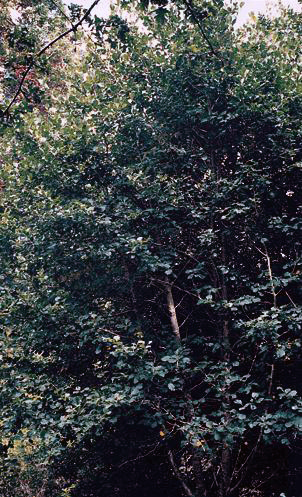 Black hawthorns like lots of sunlight to grow to tree size. The apple-like fruit provides food for birds in the winter. Impenetrable hawthorn thickets are good nesting and denning or resting and sleeping sites for small birds and mammals. The Thompson and Okanagan peoples used the thorns to pierce ears and to probe boils and skin ulcers. The Lillooet and Gitksan people made fish hooks from them. The strong, hard wood made durable digging sticks and handles for implements. The Cowichan people burned the leaves, inner bark, and new shoots and mixed the ashes with grease for a black face paint used in winter dances. 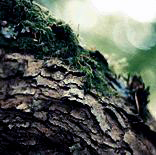 The name Crataegus is from the Greek word kratos, meaning "strength," because of the great strength of the wood. The common name, hawthorn, comes from its early use as a hedge. The Anglo-Saxon haguthorn is "a fence with thorns."